Hint: the dim sum restaurant is on the 2nd level of Hong Kong city hall. Don't be put off when you arrive and either no one seems to be about or else there's a concert on (it's also the city recital centre). Go upstairs and you will discover a crowd of people clutching tickets and waiting for their numbers to be called. We were lucky number 100 and though we had to wait about 30 minutes, it was worth it for the best dim sum either of us had had. Waitresses push steaming carts around, like Victorian barrow ladies, yelling their wares. The pork buns were particularly stellar, like Chinese pasties. 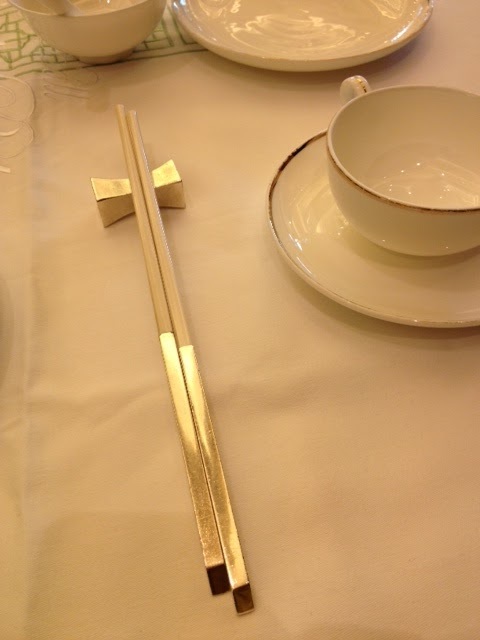 We also liked the silver-plated chopsticks. Hint: be brave when friends take you out to their favourite local fish restaurant. The restaurant we went to was the kind that we, as tourists, would never have found on our own, being in a back street of Aberdeen, a former fishing village now swallowed by the city. We were taken outside to meet our supper and though a little nervous, decided we couldn't be less than intrepid and gamely agreed to everything that was suggested. We shouldn't have worried: we had delicious poached grouper with ginger and sesame oil; salt and pepper squid; razor-shell clams with black bean sauce (tricky to eat with chopsticks, let me tell you); regular shaped clams; and chicken. Over the course of the evening, we were given a very helpful hint by our hosts: it's not considered impolite in Hong Kong (in fact it's positively encouraged) to ask the waiter for boiling water in which to rinse your chopsticks, spoons etc. However, this is a hint probably more appropriate to establishments without silver-plated chopsticks. Was it chicken of the sea?